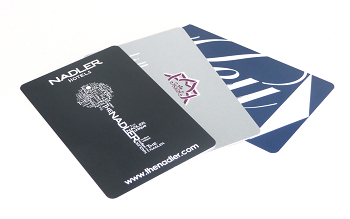 The key card is fast becoming the default in the hotel industry, providing many advantages over standard keys. We understand that you want your key card to be both secure & reliable, which is why we use only the highest quality Hi-Co & Lo-Co magnetic stripes & the latest, most advanced printing technologies to produce a key card that will have excellent longevity. We also have a full & extensive knowledge of all the chip technologies to support all types of room control, & all RFID card technologies are supported including MIFARE, MIFARE Ultralight® & hitag2. Where the key card comes into its own is in the potential to gain extra profit by using the card as an advertising tool. As well as using the key card to promote your own services, you could also sell the space on your key card as advertising to a complimentary business in the local area.